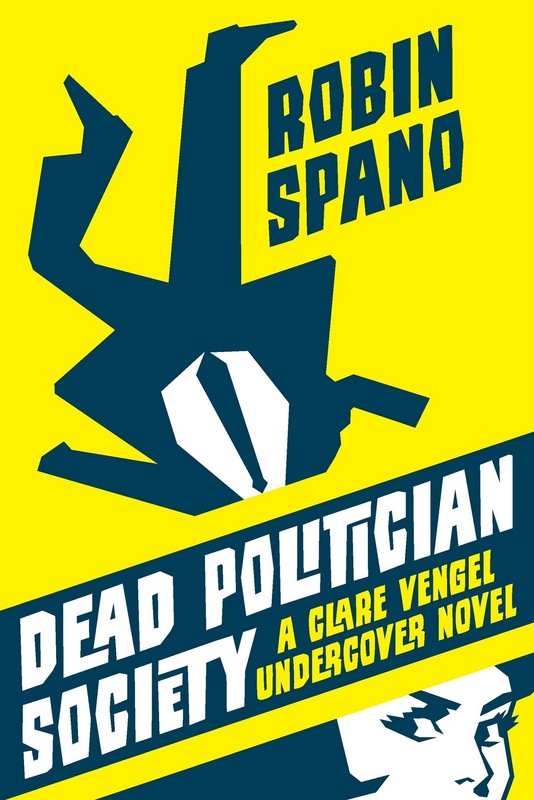 Tonight, I'm honored that Robin Spano, debut author of Dead Politician Society, has stopped by to guest post on a subject near and dear to her as a new writer. I had a chance to review Robin's incredibly fun and edgy book a few months ago (read my review by clicking here). I'd love to hear your thoughts to the challenge she poses to all of you in this post! The online revolution is a new writer's best friend. Gone are the days when new and lesser-known writers had to languish in obscurity, only sometimes on some shelves, while big famous names – Nora Roberts, Stephen King – were everywhere for all book-buyers to see. It's still famous names on the buzz tables. And airport stores and drugstores only stock bestsellers. But shelves aren't where people are shopping. Online retailers have just started to outsell brick-and-mortar stores. The ebook revolution takes that further – on Amazon, Kindle books have begun to outsell hardcovers. This is sad news for bookstores – particularly independents, who do a lot for the book community. Maybe we'll see a shift to wine and book bars, or library-cafes with literary readings - I look forward to seeing how creative store owners are able to change with the times. I'd love to see a government incentive program help stores make the transition. But we can't stifle progress because one side of the industry is dying. There is so much rebirth going on. Yesterday, Publishers Weekly's released a report saying ebooks have reached 8.7% of the total book market share. That's up from 1.5% in the first quarter of 2009. Sales can't keep climbing at that rate – they'd be over half of the market by the middle of 2012. But ebooks are finally at a place where even those who fear them can't ignore them and hope they go away. As a new writer, these statistics are the happiest news I could hear. Ebooks and online retailers go a long way toward leveling the playing field, so new and lesser-known writers can have their work available to anyone, anywhere. Publishers are less thrilled, but the savvy ones are shifting their business models to include and promote ebooks. My publisher, ECW Press, has even recently launched an ebook imprint. But what no one seems to know is how to price ebooks. New releases are currently valued between $10-$12. I think that's a ludicrously high standard set by fearful big publishers who are afraid of ebooks putting them out of business. I guess they think if they price the ebook so high, it won't steal their print sales – and if it does, they won't lose money. It's time to kill that fear. Ebooks are here to stay, and they are by no means terrorizing the industry. Environmentally, they're a massive step forward. It's time to figure out a price that's both fair to the consumer, and still makes it worth a publisher's and writer's time and effort. I think that price is $4.99 – about half of a mass market paperback. An ebook can't be loaned, it can't be signed, and – come on publishers, you know this: it costs a lot less to produce. ECW Press disagrees. They've priced my mystery novel at $10.99. They don't want to make it lower because (a) they're afraid to devalue it by making it less than other new releases in its genre, and (b) they don't think people shop based on price – they don't think more copies will sell if it's cheaper. I differ on both counts. On (a) I promise not to feel devalued. I'd like the book to cost what it's worth – not what the big publisher dinosaurs are trying to set as the standard. On (b) my mouth drops. What? Who doesn't shop based on price? Take me shopping. So they've set up this challenge. I feel lucky to be with ECW, because they're like that. They don't tell me to go away with my little opinion – they say, okay, we'll entertain this. Until Monday, December 13th, Dead Politician Society is $1.99 in iBooks, Kobo, and Kindle stores. ECW has run similar experiments and they've seen no spike in sales. So if sales stay static, I'll concede – I'll agree that price doesn't drive ebook sales. But if sales do spike, ECW will look at what book buyers are saying to them. They'll rethink their price structure. They might not change all at once, but they love books, they love readers, and they care about going strongly into the future. Thank you so much for stopping by, Robin - I look forward to the next book in the Clare Vengel series! And I encourage all of you to take on her challenge! I agree with everything you're saying. I don't think a month long experiment is long enough to gauge how pricing affects sales. Personally I feel that $2.99 to $4.99 is the best price. I don't own an e-reader yet, but that will change by middle of next year. I'm a fan of J Konrath's and he has common sense stats on pricing on his blog. I feel that publishers have been avoiding this issue for a long time. It's obvious that the current publishing industry model is broken. If publishing was a bank, my money would stay under the mattress. Big publishers know how important ebook rights are. They won't let the author keep them. There's a good reason for that! It's not rocket science. I think writers are in the best position we've been in since forever. Be patient and weigh up all the options. The stats for writers being successful at this are pretty dismal, but if you're passionate about your writing the extra time looking at options will only benefit you. Oh, and I love Robin. I have you on my to buy list! Cool. I'll check out J Konrath's blog. And yes, this is an empowering time for writers. We're moving up from the lowest life form in the industry. Ha ha, and statistically you're right - if e-readers keep selling at their current rate, they'll be in every household by the middle of next year! I am self-published, so I get to set my price. I was also unknown when I published my historical mystery, Maids of Misfortune a year ago. I had read Konrath-who was just at the beginning of his experiments with price, and I initially started with $3.99, but as I read more about pricing, I decided that as an unknown $2.99 was indeed the sweet spot to get people to try me. Now I know that lowering the price alone didn't cause all of my success, but it did start me on the upward climb, and now I am averaging 27 books sold a day. It might take more than a month, but I know that if your book is going to sell, it will sell faster if it is at a lower price. I think $1.99 is too low-but in part that is because as a self-published author I have to sell at $2.99 price point to get my 70% royalty from Kindle. But hey, that means I am making over $2 a book or over $50 a day, which isn't anything to sneeze at. I hope for your sake the experiment works, not only because it will mean more sales for you, but because I think in the long run traditional publishers need to understand the consumer mentality among those of us who read ebooks. I don't mind paying up to 9.99 for a book that is just out by an author I have read and love and can't wait to read their newest, but for anything else, I will just check out one of the myriad of other cheaper options. What I can't understand is when the ebook price is the same or sometimes higher than the paperback price. That just makes me mad. I know how little work it takes to create an electronic file and upload it-cause I did it myself. And editing was done and the cover was already designed for the print book, so where's the expense? wow Robin, I loved your book, I loved the guest post you did on my blog, A Novel Source - but you just blew me away with this one! So very incredibly impressive! I'm going to re-tweet this one and link back to this post and re-post about this (as long as you're ok with it Natalie?) What an awesome thing to do this weekend! I wish you the best of luck in selling Dead Politician Society! And hurry with the next one! Great post! If I had an Kindle or something I would totally buy it. How can you go wrong for that price? I read a lot--and quickly--so it's impossible for me not to look at price. No point spending $30 on a book I'll finish in a day. What a great discussion. Price is an important issue, but so is getting opinion leaders to read the book. Independent book sellers have always been great sources for information on new authors. Book blogs can take on a portion of that role, but they are so diverse -- and there are so many. How are authors and publishers negotiating that shift, I wonder? What a wonderful post! I agree with everything Robin says and feel the price of e-books should be lowered, as there is virtually no production cost whatsoever. Publishers need to realize that we are moving towards a new model in book selling and that they also must adjust accordingly. I applaud your efforts to make them see that, Robin, and just wanted to tell you that before leaving this comment, I went over and purchased your book. Thanks for the great and inspiring post. Louisa, thanks for sharing your market research - I'm excited to hear about the volume you're doing. This challenge is only for a week - thus the super low price (we need the fast results). My preference would be a year at $4.99 or less, but I'm still glad my publisher is on board for anything at all. Stacy - yeah, that would be awesome. Like, very awesome. Connoly-Ahern - My publisher was great about getting the book reviewed in the usual industry places, but I made the contacts in the blogsphere. I recently saw a study saying book-buyers listen more to blog reviews than established industry ones now. Which to me is good news - blog reviewers aren't getting paid (they don't need to be anyone except who they are), and they have a more authentic connection with their audience. Zibilee - thanks! I've seen you around the blogosphere and I'm thrilled that you're about to meet Clare! I agree completely. I have had a kindle for almost two years, and while it is for me the most convenient way to read, I won't buy an ebook unless it is under $10. I will definitely be looking into Dead Politician Society and if it is a book I think I would enjoy, the price of $1.99 is a dream come true. I always wonder what authors think of book pricing. I know some e-book prices see really high to me. I don't know all the technical work that goes into producing e-books but in the long run, it seems, the over heard should be less than traditional books. That being said I don't want to undervalue the work of the author. It's nice to hear from an author that my thinking isn't off the mark on what publishers should be charging for e-books. Great post. I understand the publisher's resistance to lower the price. So much of buying nowadays is also about the purchase of an experience, not just a thing. I don't own an e-reader yet so perhaps I will feel differently once I do. My boyfriend has finished his first novel and we've discussed his options now that his feels ready to try to publish. This is a great time for new writers, but finding the right paths to publication and promotion is vital. Hey, Purest Green, congratulate your boyfriend for me. For what it's worth, I love my small press experience. I know you're supposed to want one of the big houses - and maybe they sell more books - but I like the way ECW press treats me. They hold my hand as I try to navigate the industry, and they consider every weird idea I put forward. Good luck whichever way you go! L.L. - thanks for sharing your perspective as a longtime Kindle shopper!! People like you are hard to find. marthalama & Purest Green - Yeah, you're buying an experience that you don't want to undervalue. But ebooks can't be loaned out easily. So you're buying one read. With a print book, you're potentially buying several reads. I think it's a combination of price and promotion. Getting the word out is half the battle, but you're doing a great job of that, Robin. As for me, I love to support my writer and blogger friends, and with ebooks, I can buy more books for the same amount of money I used to spend on hardcovers or trade paperbacks. I love it. I put my own out of print mystery on Kindle and Nook this week, and priced it at $3.99, mostly to be consistent with other ebooks from my original publisher. Here, here! I've had my Nook since May, and I do price shop. I refuse to purchase an e-book if it costs the same as or more than the printed version. I scour the discounted e-books and tend to get ones that cost less than $5. I've splurged every once in a while but I tend to stick to this approach to purchasing e-books as much as possible. Good luck with your experiment! I hope it proves you right! It's nice to hear an author's perspective on the evolution (at time revolution) in the publishing industry today.